Prepare for burnination and other horrible punishments at the hands of this fireball-spouting multitalent. 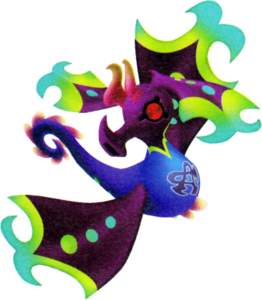 The Tatsu Blaze is a Dream Eater that appears in Kingdom Hearts 3D: Dream Drop Distance. The Tatsu Blaze is a pallete swap of the Tatsu Steed, based on a leafy seadragon, a type of sea horse-like animal known for its long seaweed-like body parts. This is referenced in the fact that the Tatsu Blaze, unlike the Tatsu Steed, has longer fins and such. 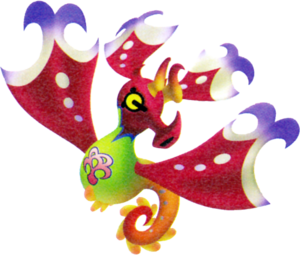 It also places emphasis on its fire-based abilities by the Spirit's red fins and body, which can be changed using Paint Guns. ↑ 1.0 1.1 Becomes available when in Two-face disposition. ↑ 2.0 2.1 2.2 2.3 Becomes available after unlocking Secret: Green at C-5. ↑ 3.0 3.1 Becomes available when in Deadeye disposition. The default Tatsu Blaze Recipe can be purchased from the Moogle Shop for 100 munny once Traverse Town has been visited for the second time. The Tatsu Blaze can be created through five different recipes. The first recipe is a rank F recipe. The second recipe is a rank E recipe. The third recipe is a rank C recipe that has a 40% chance of transforming from Tatsu Steed. The fourth recipe is a rank B recipe. The fifth recipe is a rank A recipe. This page was last edited on 3 April 2019, at 18:57.